The Expertflow Voice Recording Solution is a replacement of Cisco Mediasense, for single-site contact centers up to 100 concurrent agents. 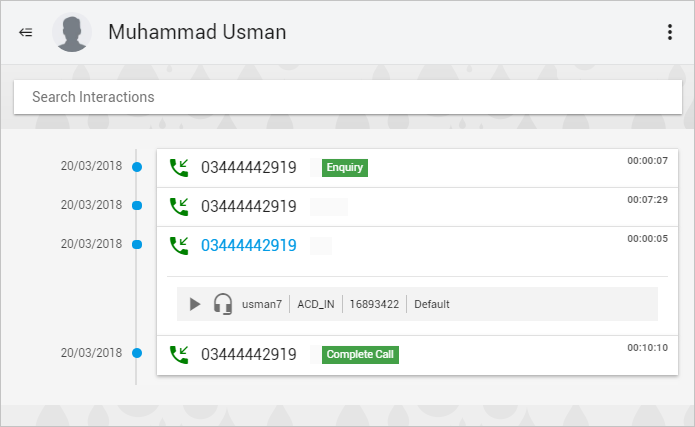 Calls are recorded & stored as individual call legs including call hold, call transfer and call conference. The recordings can be archived, deleted or downloaded, and a RESTful API provides access to all objects. The API can also be used to extract information from a voice stream or individual sentences (separated by non-speech periods). These can be fed to speech analytics, such as Voice Biometry, Speech Recognition or Emotion Detection algorithms. With the CIM API Pipeline, output from these can then in turn be fed into a Chatbot or NLU engine to predict knowledge base articles or agent activities relevant to the current state of the conversation. Recording is done with “Built-in Bridges” “BIB” – an approach that uses the conference bridge available for almost all Cisco IP phone types. The Recording streams are forked from an agent IP phone to the EF-recorder. The agent and customer voice are sent and stored as separate call legs. They arethen mixed by EF-Recorder. Recording is initiated by CUCM using SIP commands. EF_Recorder is configured on CUCM as a SIP trunk device/ SIP server in order to receive calls and recording streams. It captures every SIP event. Based on those events, recording is done using RTP. The three components of the solution are the Recorder and the Mixer. The Recorder has data structures implemented to store details of a call in memory. It stores call sessions, call legs, as well as the complete call in a data structure. Once a customer-facing call ends, it then links all legs to a single call object. The identification of each call is done via Xrefci Id from SIP Packets using rapid in-memory storage. The Mixer is responsible for merging all legs of a call into a single playback session, and optionally store it as a .wav file depending on the configuration. REST APIs are used to fetch and play/download recordings from the database. 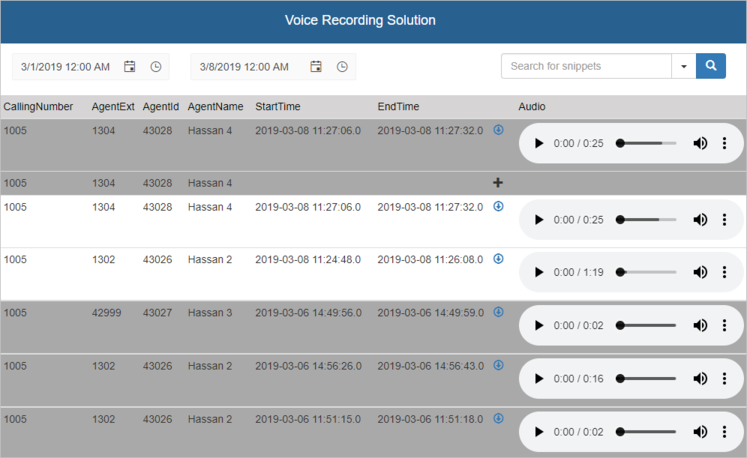 The Voice Recording Solution allows to search & play the recordings based on certain parameters like AgentId, agent Extension, date filter, customer number, etc. When purchased Expertflow CIM, users can also view the past interaction history of the customer along with links of the call recordings in the Interaction History gadget. 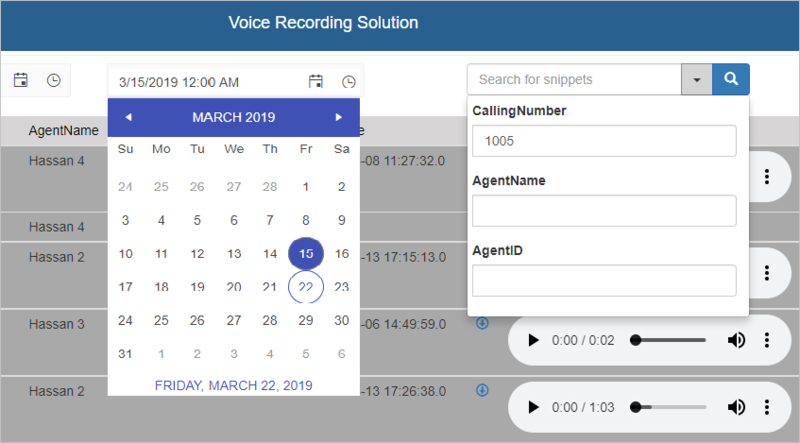 This allows supervisors and managers to view past customer interactions and a recording player to playback and listen to the call recording instantly.